These load cells can accommodate a variety of capacities and are used for weighing applications in tanks, hoppers, and vehicles. Other uses for canister load cells include automotive component testing, industrial automation, lifecycle testing on small components like hinges and latches, and switch test stands. Canister load cells have a built-in mounting base for easy installation and can be used for both tension and compression forces. There are two main kinds of canister load cells: stainless steel and carbon steel canister load cells. Tension/compression carbon steel canister style load cells can be extremely resistant to excessive bending and side load forces and have capacities up to 10,000,000 N when paired with the right mounting hardware. As a result, bending strains at the strain gage are accounted for, thus reducing the possibility of load cell failure. Some manufacturers provide a dual bridge option for better feedback control and redundancy. Stainless steel canister style load cells incorporate a button style design and have a small footprint which allows them to be used for applications which require high capacity yet must fit into tight spaces. These ultra-precision, highly reliable load cells can measure compression load forces in ranges between 5lbs and 1000 tons with accuracies up to 0.03%. 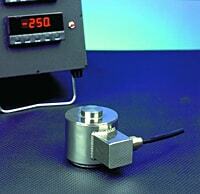 These load cells also come in a variety of sizes with diameters as small as an inch up to almost a foot. The size of the model will depend on the magnitude of the load being applied to the load cell and the types of load being applied. There are many aspects and features to consider when deciding on the right canister load cell for a given application. Some important aspects to consider include mounting systems, load capacity, accuracy, number of load cells, and the load cell size. Canister load cells provide the benefit of long-term performance in a compact and cost-effective package. They are especially useful for many high-capacity weighing systems. However, it is important to remember that some compression cells can be damaged by seemingly small side loads. It is best to use canister load cells with priority mounting hardware to ensure that the cell is protected from side loads and to ensure correct load introduction. 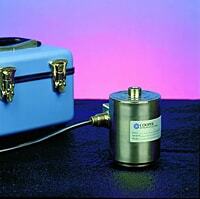 Canister Load Cells Canister load cells are built for compact and cost effective weighing applications.